Key Ketton player Tom Sole. Ketton could seal the Cambs Division One title tomorrow (September 9). The Rob Vitas all-stars are at bottom club St Ives and a win coupled with a defeat for sole challengers Ramsey at home to Nassington could seal a first Division One success. More likely the race will go down to the final weekend (September 16) when Ketton are at next-to-bottom March and Ramsey host Eaton Socon. Ketton bowled a seven-man St Ives side out for 39 last weekend when Ramsey beat Nassington away from home by five wickets thanks mainly to 6-35 from Jonathan Cade. March could be relegated tomorrow even if they beat reigning champions Foxton at Burrowmoor Road. Warboys have conceded their Division Two match at Ufford Park. (11.30am) Premier Division: Finedon v Peterborough Town, Oundle v Old Northamptonians. (Noon) Division Two: Peterborough Town 2nds v Northampton Saints 2nds. (Noon) Division Three: Kislingbury v Oundle 2nds. (12.30pm) Division Eight: Oundle 3rds v Raunds 2nds. (Noon): Boston v Spalding, Bourne v Gr imsby, Market Deeping v Grantham. (Noon) Division One: March v Foxton, Ramsey v Nassington, St Ives v Ketton, Eaton Socon v Wisbech. (1pm) Premier Division: Billingborough v Spalding 2nds, Skegness v Bourne 2nds, Stamford v Market Deeping 2nds. (1pm) Division One: Baston v Claypole, Long Sutton v Belton Park, Moulton Harrox v Boston 3rds, Welby Cavaliers v Skegness 2nds. (1pm) Division Two: Pinchbeck v Long Sutton 2nds, Spalding 3rds v Belton Park 2nds. 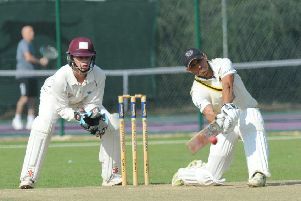 (1pm) Division Two: Barnack v Peterborough Town 3rds, Bharat Sports v Alconbury, Nassington 2nds v Godmanchester 2nds. (1pm) Division Three: Burghley Park v Biggleswade, Hampton 2nds v Upwood, Orton Park 2nds v Falcon, Ramsey 3rds v Huntingdon 2nds. (1pm) Division Four: Newborough 2nds v Brampton. (12.30pm) Division One: Barnack v Oundle, Grantham v Wisbech, Market Deeping v Bourne, Nassington v Peterborough Town, Stamford v Ketton. (12.30pm) Division Two: Burghley Park v Uppingham, Newborough v King’s Keys, Uffington v Whittlesey, Ufford Park v Weldon. (12.30pm) Division Three East: Hampton v Alconbury, Market Overton v Werrington, Ramsey v Nassington 2nds. (12.30pm) Division Three West: Easton-on-the-Hill v Stewart & Lloyds. (12.30pm) Division Four East: Moulton Harrox v Newborough 2nds, Spalding v Ufford Park 2nds, Whittlesey 2nds v Uffington 2nds. (12.30pm) Division Four West: Barton Seagrave v Hampton 2nds, Benefield v Sawtry, Bourne 2nds v Weldon 2nds, Huntingdon v Peterborough Town 2nds.